Wyndham Destinations, Inc. (NYSE: WYND), formerly known as Wyndham Worldwide Corporation, rang The Opening Bell® at the New York Stock Exchange today. The company began trading on the NYSE on June 1 under the new ticker symbol “WYND,” following the spin-off of Wyndham Hotels & Resorts (NYSE:WH). Wyndham Destinations is the world’s largest vacation ownership and exchange company with a global presence in 110 countries at more than 220 vacation ownership resorts and 4,300 affiliated exchange properties. 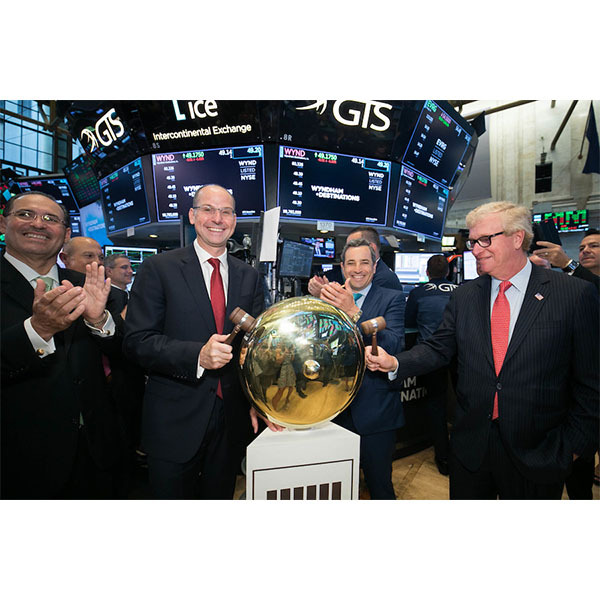 Wyndham Destinations President and Chief Executive Officer Michael D. Brown was joined by members of the company’s senior leadership team and Chairman of the Board Stephen P. Holmes on the podium for the honor of opening daily trading on the exchange. The event marked another significant milestone in the new Wyndham Destinations story. On June 1, the company announced the establishment of its global headquarters in Orlando during an event involving elected officials and community leaders, including Florida Governor Rick Scott. The event highlighted the thriving tourism and the creation of new jobs in Central Florida. Brown said “Our industry has brought incredible value to the Central Florida economy. The vacation ownership industry in Orlando accounted for more than 45,000 jobs and $502 million in state and local tax revenue. With 72 million visitors last year, Orlando was America’s most visited destination and we’re proud to call it our home.” The company also unveiled a new logo and video to launch the brand’s official debut and to celebrate the Wyndham Destinations mission to put the world on vacation. The Opening Bell Ceremony took place at 9:30 a.m. EDT, and a replay can be viewed on the NYSE’s website.